It has been a 2 weeks since we said our farewells in Kathmandu. It seems like a lifetime ago. On Monday, the 29th of January, we arrived in Bangkok and found warm air and humidity. Fortunately the temperature has remained below 90 degrees so far. A 30 degree change is change enough. 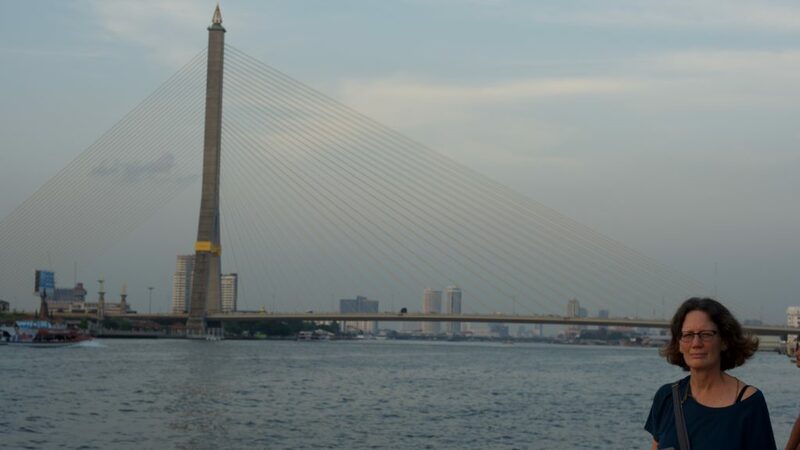 Joni with the Rama Bridge in Bangkok. 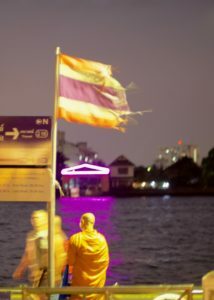 Night shot of Buddhist Monk waiting for a water taxi. In the first week I felt like I was emerging from a fog. Perhaps it was due to our recovery from the cold (flu?) we had in the final days in Nepal. Add to that, we have been grieving the end of our time with the girls at Tsoknyi Gechak School. While the experience brought many challenges, our connection with the girls was strong, sweet and freeing. At home in the monastery we were wrapped in a community of caring people and the routine and rhythm; from the morning gong, meditation, breakfast, water bucket routine, school preparations, classes, lunch, more classes, afternoon walk and finally battening down the hatches for the cold night. As I often described in past stories, the rhythm had a periodic back beat of surprises and disappointment when water wouldn’t come or a special puja interrupted the normal day. But even these surprises became part of the pattern of living over time. Funny how we long for adventure and the unusual while, at the same time, we thrive on routine and regularity. As we have emerge from the routine and regularity of life at the monastery we have maintained a pretty mellow pace. 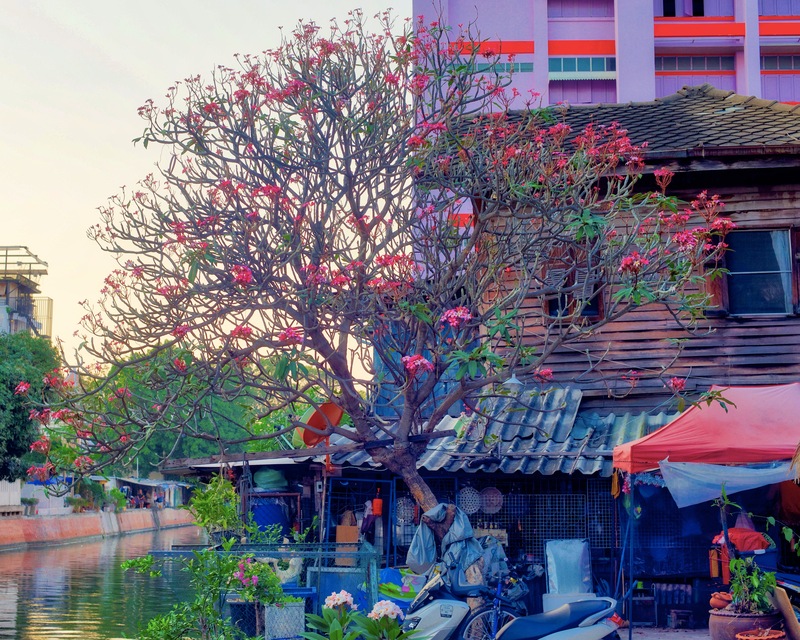 Our first 3 days in Bangkok were spent touring a few of the temples (Wat) and enjoying scenes along the river, close to our modest hotel. The buildings and flowers bring a lot of color to Thailand. Traveling from Bangkok to Chiang Mai, Thailand we continued our slow pace, strolling around the town and enjoying the scenes of the street, the annual “Flower Festival” and the night markets. Our most ambitious activities in Chiang Mai were a trip to Wat Phra That Doi Kham (that’s a mouthful); a temple on a mountain overlooking the city. Joni among the crowd making offerings to benefit friends, strangers and loved ones. A Wat is a temple. 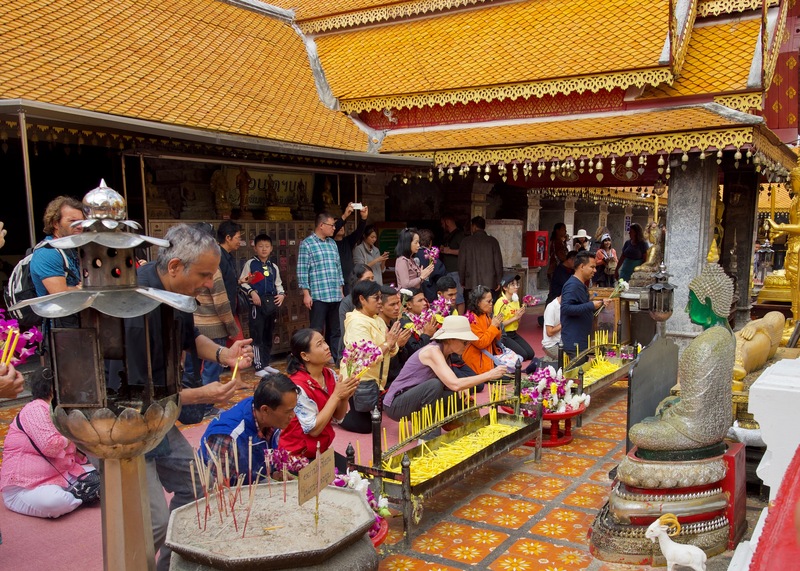 There are over 300 temples in Chiang Mai alone. On another morning we went into the countryside where we visited an elephant sanctuary. 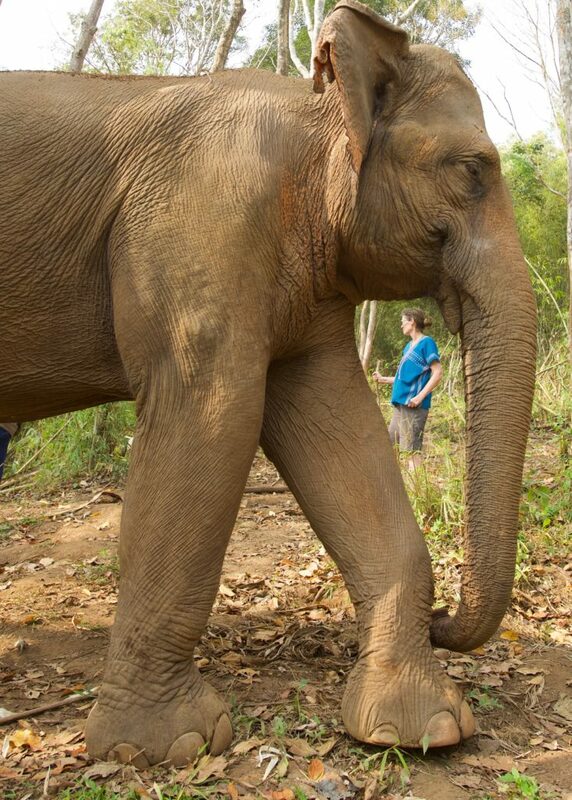 After asking around for a few days, we found a short tour that promised to support a humane home for elephants. While it took an hour to drive each way, we were treated to a very interactive and hands on visit with 3 elephants (Pancake, Maya and Jumbo). Elephant friends – up close and personal. 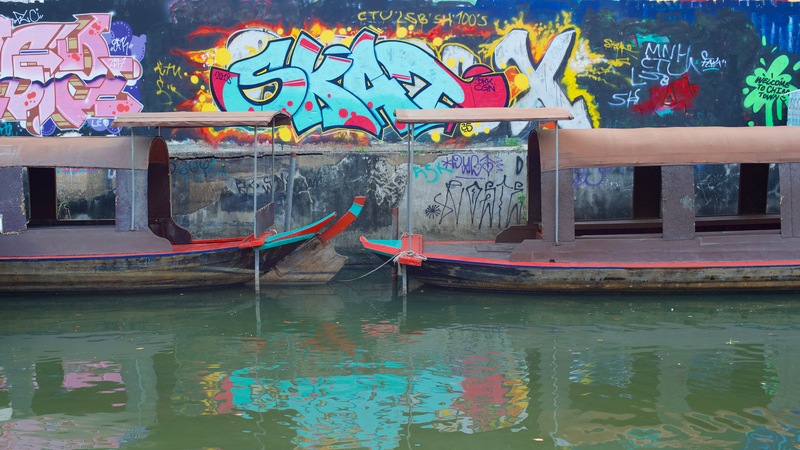 After spending 5 nights in Chiang Mai, we took a day to travel to the island of Koh Chang. This required an hour flight back to Bangkok and 6 or 7 hour drive southwest in a mini bus. Fortunately the roads are smoother than those we left in Kathmandu. By evening we arrived at our new, temporary, home; the Oasis. An Oasis it is. Sitting in the Jungle on a hill about 100 yards above the beach, it is quiet and very relaxed. Our Dutch hosts have been running this place for 6 years and do a very good job of catering to (mostly) young and old, European, Asian and American guests. The open air dining room is home to 2 dogs and 3 or 4 cats (they come and go). The animals and humans are all very mellow and friendly, moving at a slow, steady pace. Things start late in the morning with breakfast at 8:00am. This is in sync with the beach parties we can hear (faintly fortunately) that last until 3:00am or so. My only complaint is that 50% of the people here smoke. They smoke on the streets, in the bars, on the beach and in restaurants. It’s a thing I guess. I honestly can’t think of anything else to complain about in this slow moving paradise. It is a privilege to be here; hanging out on the beach, reading, meditating, eating incredible (and inexpensive) food, drinking beer, and enjoying relaxed conversations with Joni. Add to this we have both enjoyed 2 – one hour long massages on the beach, getting our skin bathed in Aloe after too much sun. What a life! One more night left here on Koh Chang. Now we are north of Lonely Beach at Kai Bai where we are staying at “The Stage”, a little place just off Kai Bai Beach. 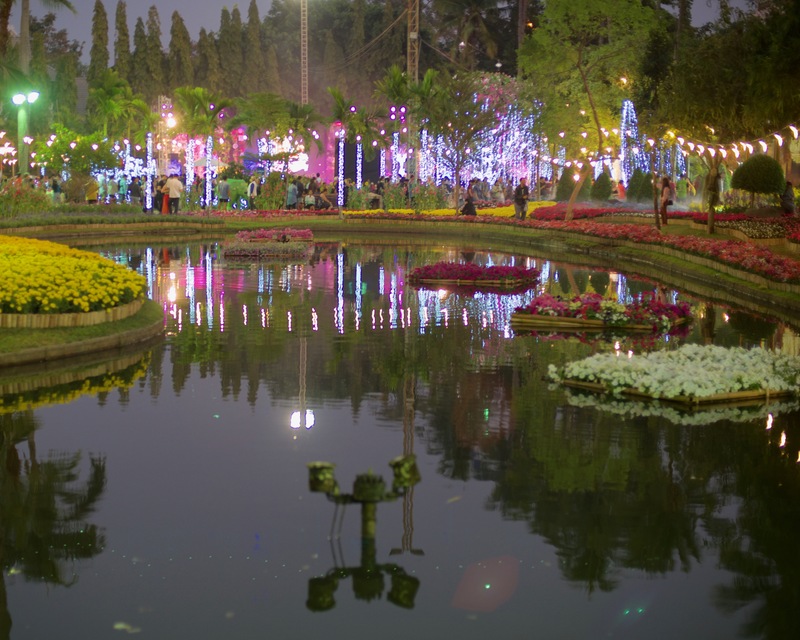 This strip of paradise caters more to adult tourists and families so things are a little more polished. 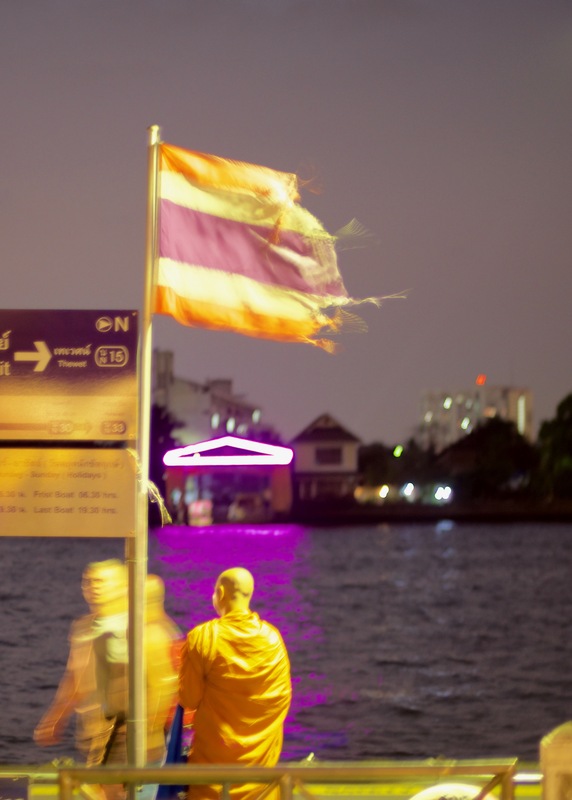 Tomorrow we will take the 6 hour bus ride back to Bangkok where we’ll spend one more night. For better or worse, we won’t be staying in a hotel on the second day in Bangkok because our flight to Japan leaves at 12:05am on the 15th. It is a challenge to be present when another voyage looms on the horizon. It has taken me forever to post this entry, so I’m going to post this now – without further elaboration. I hope that this message finds you well, wherever you are. Funny thing about traveling so much… I realize that wherever I go – there I am. In other words, it doesn’t really matter where I am. Most important is being present and making the most of it; with the people, my awareness and the most peaceful behavior I can muster. Cheers!